The number of estate tax returns declined 87 percent from about 73,100 in 2003 to about 9,400 in 2012 primarily due to the gradual increase in the filing threshold. The gross estate filing threshold was $5.12 million in 2012, up from $1.0 million in 2003. 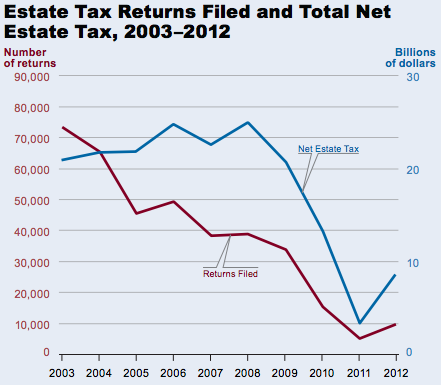 In 2012, the total net estate tax reported on all estate tax returns filed for the year was $8.5 billion. California had the highest number of estate tax returns filed in 2012, followed by Florida, New York, Texas, and Illinois. Does the significant decline in the number of estate tax returns (due to the threshold for such returns increasing to $5.12 million in 2012 from $1 million) mean that only the “wealthy” (i.e. those with estates in excess of $5.12 million based on the 2012 threshold), need to be concerned about an estate plan and the avoidance or minimization of estate taxes? Absolutely not. While the avoidance and/or minimization of estate taxes is certainly one good reason to engage the services of an estate planning attorney, there are a number of other reasons to consider which will be discussed in part 2 of this blog series. Will A Living Trust Eliminate Estate Taxes? A revocable living trust allows couples to effectively double the estate tax exemption (currently $5,000,000). If you only had a will, as opposed to a trust, which left everything to your surviving spouse, you would lose your exemption. The trust lets you keep your exemption, which could potentially save over $1,000,000 in taxes. For specific questions about setting up a living trust and estate taxes, please contact our Estate Planning Attorney in Los Angeles today at (818) 501-5800.